In the summer of 2009, as she was covering the popular uprisings in Tehran for the New York Times, Iranian journalist Nazila Fathi received a phone call. They have given your photo to snipers,” a government source warned her. Soon after, with undercover agents closing in, Fathi fled the country with her husband and two children, beginning a life of exile. 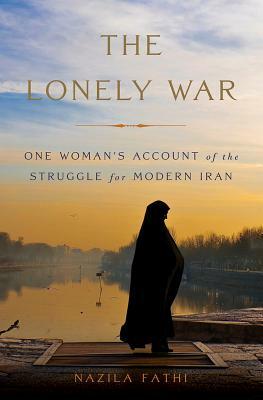 In The Lonely War, Fathi interweaves her story with that of the country she left behind, showing how Iran is locked in a battle between hardliners and reformers that dates back to the country's 1979 revolution. Fathi was nine years old when that uprising replaced the Iranian shah with a radical Islamic regime. Her father, an official at a government ministry, was fired for wearing a necktie and knowing English; to support his family he was forced to labor in an orchard hundreds of miles from Tehran. At the same time, the family's destitute, uneducated housekeeper was able to retire and purchase a modern apartmentall because her family supported the new regime. As Fathi shows, changes like these caused decades of inequalityespecially for the poor and for womento vanish overnight. Yet a new breed of tyranny took its place, as she discovered when she began her journalistic career. Fathi quickly confronted the upper limits of opportunity for women in the new Iran and earned the enmity of the country's ruthless intelligence service. But while she and many other Iranians have fled for the safety of the West, millions of their middleclass countrymenmany of them the same people whom the regime once lifted out of povertycontinue pushing for more personal freedoms and a renewed relationship with the outside world. Drawing on over two decades of reporting and extensive interviews with both ordinary Iranians and high-level officials before and since her departure, Fathi describes Iran's awakening alongside her own, revealing how moderates are steadily retaking the country. Nazila Fathi worked for two decades as an Iranian correspondent for "The New York Times" before being forced to flee the country in 2009 at the height of the Green Revolution. Currently a writer for NPR and "Foreign Policy" and a commentator for Persian Language Voice of America television, she has held fellowships at Harvard University's Belfer Center at the Kennedy School of Government, Harvard's Shorenstein Center for Press and Politics, and Harvard's Nieman Foundation, as well as at Lund University in Sweden. Fathi holds an MA in Political Science and Women's Studies from the University of Toronto. A frequent guest on BBC, CNN, NPR, and Fox News, she has also written for "The New York Review of Books," "Time," CNN.com, Agence France-Presse, Harvard's "Nieman Reports," and the online news outlets openDemocracy and GlobalPost.